Airlines depend on business travel for a significant portion of their revenue. 1. What Factors Determine the Price of Stocks? 2. What Drives Stock Market Cycles? 3. Why Do Stock Prices Drop? Cyclical stocks rise during the growth phase of an economic cycle and fall when the economy slows down or experiences negative growth, which is recession. Airline stocks are cyclical because leisure travelers and businesses cut back on travel plans when there is economic uncertainty and are more likely to make travel plans when they have confidence in the economy. Airline companies need sufficient passenger revenues to cover operating costs and generate profits. These costs include fuel, leasing and interest charges, fleet maintenance, airport fees, salaries and advertising. The industry is very competitive because several airline companies, including discount carriers, often operate on the same routes. This means that the airlines do not have the flexibility to raise prices either to cover increased costs or expand margins. During the expansion, or growth, phase of an economic cycle, businesses feel confident and invest in infrastructure and new market opportunities. 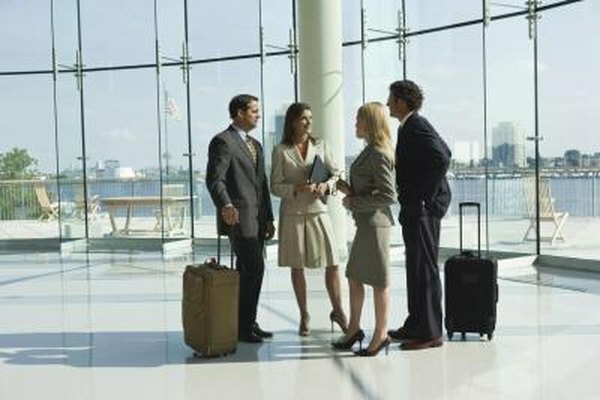 Corporate travel budgets grow for attending conferences and meeting with clients. Strong business activity also results in more jobs, which means that households have more disposable income for leisure travel. Strong leisure and business travel spending generally mean more revenue, which should result in increased airline profits and stock prices -- as long as the airline companies can manage their operating costs and inflation remains under control. Conversely, during the contracting phase of an economic cycle, business activity slows down, and travel budgets shrink as companies look for ways to cut costs. Leisure travelers also postpone trips. This means fewer passengers and fewer flights, which lead to declining revenue and profits for airline companies, which drags down stock price. Discount airlines might be able to survive and even thrive during economic downturns. This is because they tend to operate on routes with the most passenger demand, such as between major metropolitan centers. These airlines also have a lean cost structure. For example, passengers usually have to pay for on-board refreshments and to check in even one unaccompanied piece of luggage. This focus on costs allows discount carriers to keep ticket prices low and maintain market share, especially during weak economic conditions when leisure travelers and businesses are looking for cost-effective travel options. You cannot time buying and selling based on economic cycles, but you can change your asset mix based on certain indicators. For example, the pace of economic growth usually slows down when the Federal Reserve Bank starts to raise short-term interest rates. At that time, you could reduce positions in cyclical stocks and buy fixed-income assets and defensive stocks, such as utilities and health care. Conversely, you could start accumulating airline and other cyclical stocks when the Fed starts lowering interest rates to stimulate economic growth. Knowledge@Wharton Strategic Management: Around the World on $48 (Or So): How High Can Discount Airlines Fly?